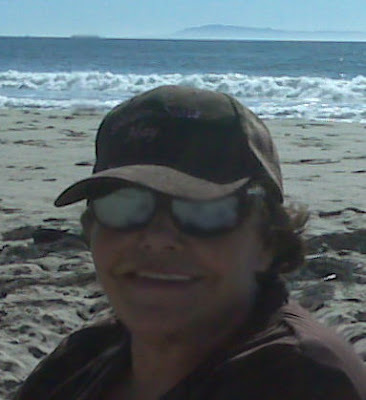 Here I am enjoying the beach and I have the Swine Flu. I totally posed for that picture. My head feels awful. I had to leave soon after our picnic because of the glare of the water and sand. 60% of people who have the flu experience chills.Tiredness is fairly mild with a cold. One way to stop the spread of the epidemic is to spread the awareness. Thursday was rough. I had a strenuous workout at the pool. My head felt like bursting and no, I had not been bitten by a vampire. The physical trainer said I need more water and that would help the headache. I figured I really doing something here. I'm so weak I almost can't get out of the pool. Yep, I worked, worked it! My long muscles were really sore and I was so hot I felt like I was having a hot flash that wouldn't quit. I positioned myself between two windows for the breeze. My brain was telling me, "Working out is really doing something here, so hot and I'm in a pool." Yes. Steve came by to pick me up and we went straight to the beach out at the Piers on the Rincon. (no piers, now...but we still call it that) It's where you see the Richfield Island. I had sunglasses, a cap, wet hair and old, torn-up, boot-cut, flared levis. I felt right at home there at my brother's favorite surfing spot. Short, fast, waves...I don't know, I didn't like a short ride. All that moving the board back-out and catching a wave; and it's over in seconds. I have great memories of this spot. Parties mainly, but the travel to the Richfield Island was incredible. It's man-made. I went there for school on a school bus that was the same width as the pier. I was so scared, but it was fun noticing all the schools of grunion swimming around out there. My class was a special summer class that was college credit and what California calls an AP class. I was so naive that when we were going out there the older boys told me that the big rocks around the island were painted with reflective paint so ships wouldn't hit it. I believed it because back then, in the mid-1960's our main Telegraph Road was repainted with the reflective paint. Shoot, I thought the reflective stuff would be painted everywhere. Good idea even now. We got out to the island and I saw what it really was... all a bunch of bird poop. There's a heavy, heavy walkway that's made of wire mesh that you can go down to a boat, or for scuba, or just to fish. I saw 4 foot in diameter starfish down there on those huge cement boulders. Beautiful purple color. The pier's heavy posts are covered with mussel and pretty fish everywhere, trying to munch on them. We were in the water to our knees because the tide had come in. We really were in there with the fish and they weren't afraid of us. I do remember it was really cold water. Remember that point. This would be a perfect surfer day. Maybe not for professionals, but for beginners. The waves were about 3 to 4 feet and broke perfectly to the left. East. Our beach faced south. 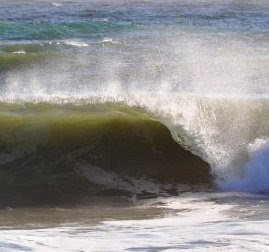 The offshore winds were going good and the mist was spraying behind the waves--so smooth looking. I would never, ever surf here. My dad told me when I was a little kid that this place was the string-ray incubation and breeding area of the Rincon. My brother's surfed the Piers all the time and never even saw a string-ray. However at the Cove or Mondos, if you fish there...you're going to catch a sting-ray. It's a great grunion spot with lots of sand. All Mormon YW and YM have their parties there. We always have a fire and the fire station is less than 1 1/2 away. Never busted. It has no signs, no lifeguards, but the best thing is... some boy scout (?) built a great set of stairs to get down the rocks. It was a wonderful place to go for a picnic. Steve had made us bologny sandwiches and after we ate, Steve started snoring. My head was pounding from the reflection of the water. I had a hard time standing. I was so worn-out from swimming and finally my fireman got on his knees and I actually used his bad shoulder to steady me as I stood-up. I walked down to the wet sand and noticed that the tide must be coming in and the breakers were getting a lot higher. I was so hot.... so I just walked into the clear water and watched my "piggie toes" be happy. I really got wet and sandy. The water was so warm and felt so good. (odd, I thought before the water was really cold, before) I wanted to farther-out but Steve was already up the hill. I didn't think of sting rays, just watched the Sand Pipers look for sand crabs. Of course, I started looking too. I walked toward the shore and as I got to the sand I looked down and I was like a Border Collie herding a flock of Sand Fleas. Actually, that was kinda' fun. Some joy in little strange things, it's so easy to entertain me. I got up the steps but the hill was harder than I thought and I was so weak. I thought of my "inner-surfer-girl" and just scurried up the hill not even thinking I might just slip-down the loose dirt. Steve came around the bush to help me and was surprised I was already up and ready to go. I did that without my arms out for balance, not holding on to anything, but my pants...they were so heavy if I hadn't held on to them I would have lost them. My feet and legs were super sandy and I got in the FJ, just that way. I thought I would take some sand in the house and sprinkle it on my bed. Memories of a kid's beach-cabin days of every summer. I was so much sicker than just tired. My head was killing me and my back, and I just couldn't down enough water. I attributed it all to my hard work-out, even my hot-feeling. As soon as I laid down my tired, pounding head; the coughing started. I made an appointment for the doctor. I'm having trouble with my medication for my heart, right? Wrong, it's the Swine Flu. I was "Typhoid Mary" at our swimming aerobic class. There were only about 2 people left swimming besides me, still attending the class. 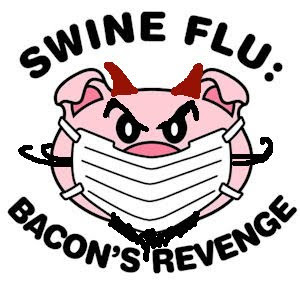 I was confirmed that I had The Swine Flu at the doctor's office. Temperature. Great, no wonder I liked the cold water. No wonder I hurt so bad... everywhere, and tired, and pounding head-ache. I was growing a bronchial pneumonia in my right lung and had a sinus infection. So now... I'm quarantined. Actually, doing my blog is hard, it's hard to sit-up straight. I was so lazy to not get the shot. This stuff hurts and if you don't take care of it, this flu will put you in the hospital. My great-grandfather, Emmett O'Connor died of the Swine Flu in 1917. My mom says that my grandpa was just a little kid (he was 9, I looked-up the records) and had to walk though deep snow in Salt Lake City, Utah to the druggist because he was the only one that didn't get sick. Odd that my thoughts go to Twilight and the Swine Flu Epidemic and Edward dying in bed. I think I'm having a mild case because younger people, my grown children's age, would have a really hard go at getting through this. It's so easy to blame aches and pains on other things and then you're the carrier or to give it to someone who could become very, very sick. Pigs laughing! Not funny, McGee! All pigs bite me when I go in the pen, like dog bites, always! Soooooo, I've had bland pork tamales since I've had this Swine Flu.. and I plan on eating more. Maybe I'll have bacon tomorrow! BTW....Don't work on your blog when you are sick. This was the hardest blog I've ever done. It took on a life of it's own. Sorry you are sick. Hope you recover soon. I am jealous of your picnic at the beach even though you hated the reflexion. Go there! Huge clean beach and the slippery the slope above the stairs would be easy with the baby, if you have your Dave--to pass her down. mother...........get better! i am so sorry that you're sick. we miss you so bad. everyday the kids ask if they can go and see you yet. adree really wants to visit with you. i love you mother!